Home › Carrie Colla, Ph.D.
Carrie Colla, Ph.D., is an assistant professor in the Dartmouth Institute for Health Policy and Clinical Practice at the Geisel School of Medicine. She is a health economist specializing in health insurance markets, insurance benefit design, provider payment, and the care and needs of the elderly. Her most recent publications have appeared in Health Affairs, the Journal of the American Medical Association, and the Forum for Health Economics & Policy. Dr. Colla received her masters in economics and her doctorate in health services and policy analysis from the University of California, Berkeley. 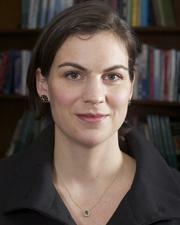 She also holds a bachelors degree in economics from Dartmouth College. Since March 2013, Dr. Colla has been the principal investigator of a HCFO-funded study assessing the prevalence, variation, and correlates of use of low-value services designated by the Choosing Wisely initiative. The Choosing Wisely initiative is a collaborative effort of the ABIM Foundation, Consumer Reports, and leading medical specialty societies that identifies tests or procedures whose necessity should be questioned and discussed by physicians and patients. The research team has created algorithms to analyze use of a subset of these tests and procedures at a local level using Medicare claims data. The goal of the project is to lay the groundwork for a policy agenda to reduce future utilization of these services and to generate hypotheses about effective payment and insurance reforms to moderate the delivery of these services. Additional information about Dr. Colla’s work is available here.